T-REX announces expanded client relationship with Macquarie Capital to its data service platform. The advisory, capital markets and principal investment arm of Macquarie Group will leverage T-REX's Performance Data Service to enhance the data management process for its global green energy business. 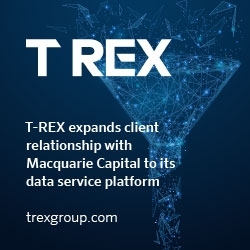 New York, NY, January 16, 2019 --(PR.com)-- T-REX and Macquarie Capital, the advisory, capital markets and principal investment arm of Macquarie Group (ASX: MQG), today announced an expanded relationship in which T-REX will onboard assets to its proprietary Performance Data Service (PDS). T-REX PDS will provide Macquarie and its clients unprecedented transparency into the performance of each individual asset throughout their multi-decade lifetimes. T-REX combines sophisticated SaaS technology with big data and asset class expertise to drive down cost of capital and reduce risk exposure for renewable energy and other esoteric asset classes. Solutions are designed to address friction at each stage of the investment lifecycle -- from origination to securitization or whole loan sales to investment. By empowering efficient, transparent finance in these markets, T-REX creates significant investment opportunities across $500 billion in new assets every year, benefitting developers, originators, investment banks, rating agencies, accounting firms, and investors. Visit www.trexgroup.com to learn about our products and services for Structured Credit Markets and for Infrastructure Project Finance.